Do you want to boost your fertility naturally? With the population boom in full blast, infertility problems in couples may seem like a rare occurrence. Sadly there are many people facing difficulty conceiving due to numerous issues. Medical statistics according to Nice (National Institute for Health and Clinical Excellence), estimate that one couple in every seven couples are affected by infertility in the UK. The good news is that Homeopathy offers an excellent option to couples who wish to boost their fertility naturally. It can help couples who are seeking assistance with becoming pregnant or as a support physically and/or emotionally for those undergoing fertility treatments such as IVF or IUI. A large number of women undergo fertility treatments such as IVF or IUI, some resort to ovulation drugs, some follow treatments for PCOS while many others try to avoid pregnancy mishaps like miscarriage. Nowadays more and more couples are opting for Homeopathy as it takes more of a holistic approach in boosting overall health at the same time as tackling fertility issues and any emotional challenges that may also arise. The inability to become pregnant after at least a year of trying to conceive is termed as infertility. Many women face difficulty conceiving due to a number of reasons such as age, uterine, menstrual or ovulation problems, sexually transmitted diseases, endometriosis, pelvic inflammatory disease (PID), polycystic ovarian syndrome (PCOS), history of miscarriages, low libido, hormonal disorders or for unexplained reasons. For men infertility may be due to problems related to motility and quality of sperm, complications after sexually transmitted diseases, low libido or genetic or autoimmune dysfunctions. Besides medical reasons, excessive drinking, smoking, drugs, weight issues, nutritional deficiencies, and toxins also affect both men and women’s reproductive health. Emotions too have a huge impact on our health and often surround fertility problems. Homeopathy offers an excellent option to couples seeking assistance with becoming pregnant or as a support physically and/or emotionally for fertility treatments such as IVF or IUI. 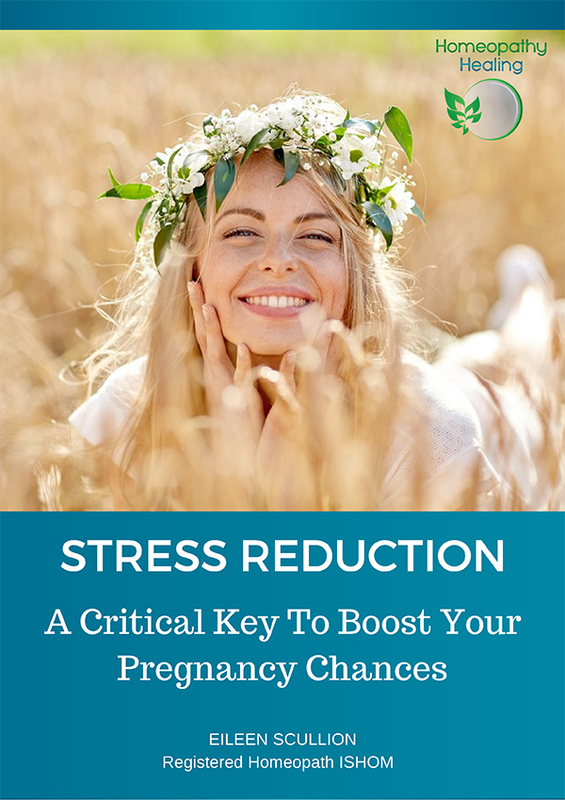 Deal with the stressful issues surrounding trying to get pregnant or side effects of fertility treatments. Release and unblock emotional problems, traumas or unresolved thought patterns that may be affecting fertility. Stimulate the body naturally to regulate and balance hormones, menstrual cycles, sperm count and motility, and enhance ovulation. Help with conditions such as PCOS, endometriosis, cysts, fibroids, pelvic inflammatory disease etc. Gerhard I, Wallis E. Individualised Homeopathic Therapy for Male Infertility, Homeopathy, 2002, 91, 133-144. An observational pilot study investigated the effect of individualised homeopathic therapy for 45 sub-fertile males, with specific reference to sperm count and quality, hormone levels and the general level of health. Sperm count and sperm motility were improved by homeopathy and the improvement was comparable with conventional treatment. Gerhar I, Wallis E. Individualized homeopathic therapy for male infertility. Homeopathy. 2002 Jul;91(3):133-44. The treatment plan for infertility Homeopathy is unique to each person. Whether treatment is to help restore a healthy reproductive system, help with specific conditions or to deal with emotional challenges, professionally prescribed remedies supported by a healthy diet, good lifestyle choices can bring about positive results for couples having difficulty conceiving. If you would like to find out if I can help you or you would like details on my Boost Your Fertility 3 Month Programme, please feel free to give me a call on Tel: 086-0891037 (Int +353 86 089 1037), email: eileen@homeopathy-healing.com or Book Your FREE from Infertility to Motherhood Discovery Session today.